I can already hear some of you muttering out there: Barely two months in Portland, and the rain has already turned her brain to mush. I know it sounds like a weird comparison, but hear me out. I search for lots of different kinds of items on eBay related to my family's history, particularly historic postcards with images of ancestral towns. Something I've noticed over the years is that the sellers who post items on eBay generally target only the market they are involved in and don't think about any cross-marketing. For example, a postcard with a scene from Tukums, Latvia might be listed as a postcard, with details about the postmark and/or the stamp, or possibly a description of the scene. But practically no one includes the sender's and recipient's names written on the postcard, even if they are in Roman characters and easily readable, in the item's description. I believe that happens because those sellers are totally focused on their own communities — collectors of stamps, postmarks, postcards, etc. — and don't see other value to the items beyond that focus. It never occurs to them that there might be a descendant or other family member of the person to whom the postcard was sent who would be interested in the item. 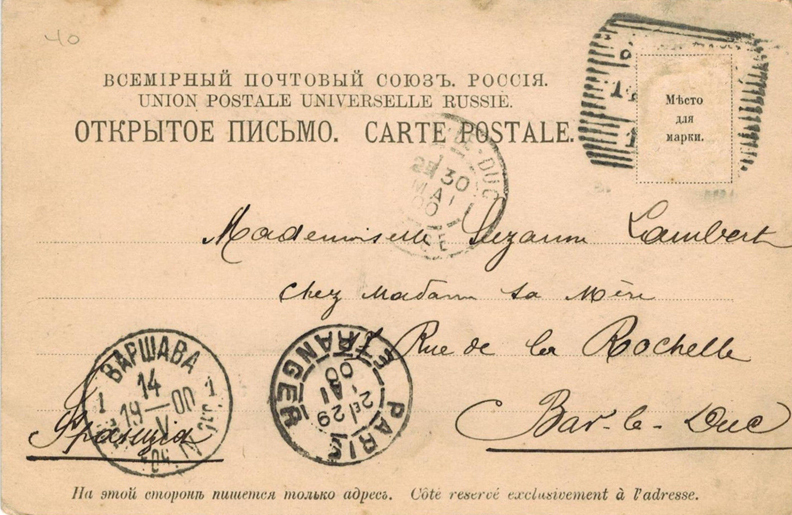 So, for example, the image shown above is the address side of a postcard with postmarks from 1900. It has a May 14 Warsaw postmark and one from May 29 from Paris. The front of the postcard has two views of Kamenets Podolsky, from the north and south. 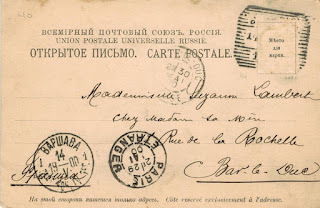 The description of the item mentioned the postmarks and that the images were of Kamenets Podolsky. It did not list the addressee — Mademoiselle Suzanne Lambert, Chez Madam sa Mére, Rue de la Rochelle, Bar-le-Duc, which translates to Miss Suzanne Lambert, c/o her mother, Rue de la Rochelle, Bar-le-Duc — even though it's pretty easy to read. If you were related to Suzanne Lambert, wouldn't you love to find this card available online? But the odds of you doing so would be diminishingly small without her name in the listing. So you need to think of other ways to search for items, such as looking for the towns your family members were in. One man I knew used that method to find some postcards sent between relatives and then followed the sellers, who continued to post more over time. Eventually my acquaintance acquired more than half a dozen postcards, which were instrumental in learning more about his family. And how does that relate to genealogy resources? 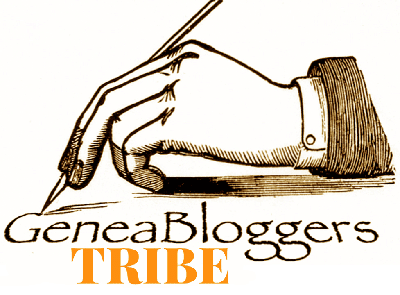 Something many, many people forget is that the vast majority of resources genealogists use in our research were not created for genealogical purposes. While the mega genealogy sites (FamilySearch, Ancestry, FindMyPast, and MyHeritage) have made it much easier to find records based on any individual's name, not all indices are that thorough. Probate records are still often indexed only by the name of the decedent and not any of the heirs. Many records in archives may not have a finding aid at all. We can't count on the repositories to create indices that cater to us, because as I said, those records weren't created for us. We need to keep in mind why records were created and how a repository uses them and then tailor our searches to fit those parameters. It's nice if a repository allows something such as an every-name index to be made, but we can't count on that.